SharePoint has been around longer than most competing collaboration tools. Despite strong support from IT pros, SharePoint faces increased skepticism from business leaders and it's unclear whether the collaboration product will deliver cloud, social and mobile advancements needed for future growth. Those are some of the findings from a new Forrester Research study published on Tuesday titled "SharePoint Enters Its Awkward Teenage Years." "Microsoft SharePoint is the centerpiece of many enterprises' collaboration and content strategies, but it isn't clear to us that enterprises will continue to invest in SharePoint to provide a broader range of social, web content, and content delivery functionality," wrote report authors Rob Koplowitz and John Rymer. The study was based on a survey conducted in August 2012 of 153 IT decision-makers involved with SharePoint implementations. SharePoint has reached mature status as a content management and enterprise collaboration tool, used primarily by companies to corral documents dispersed among file servers, email inboxes and other content management systems, according to Forrester. As such, its 2007 and 2010 versions are used by organizations of all sizes and in all industries to create and manage intranets, offer collaboration capabilities and manage content, but there is less satisfaction with and usage of it for other scenarios, such as a custom application platform and as a business intelligence tool for data analysis. The gap in satisfaction between IT pros and business managers—SharePoint met the expectations of 73 percent of the former, and of 62 percent of the latter—is of concern, according to the authors. "While 'if you build it, they will come' might work in the movies, the approach has yielded neither wide adoption of SharePoint nor satisfaction with the product. Too often, IT provides the latest and greatest SharePoint release only to watch many users turn their backs on the solution," the report reads. Dissatisfaction is centered on several areas, including adoption challenges, a dislike for the SharePoint user experience, a preference for other tools like email and skepticism over its business value. Also of concern is that takeup of SharePoint Online, the cloud-hosted version of the product, is very low—4 percent of respondents reported using it exclusively, a rate expected to rise to 8 percent after the new SharePoint 2013 comes out at some point this quarter. However, 26 percent of respondents plan to have a hybrid on-premises/cloud deployment, according to the study. There is also dissatisfaction with the enterprise social networking capabilities in SharePoint, but Forrester predicts that this component of the product will be much better in the 2013 version and beyond as the product gets more integrated with Yammer. Microsoft also must improve its efforts to deliver SharePoint functionality via mobile applications to smartphone and tablet users of various platforms, the authors wrote. Koplowitz and Rymer had words of praise for SharePoint 2013, pointing out that an impressive 68 percent of respondents said they plan to upgrade to that new version within two years after its release. Eighty-one percent of respondents are currently on SharePoint 2010, and the rest on 2007 and earlier versions. In particular, the Forrester analysts like SharePoint 2013's new development architecture, which is consistent with Web standards and is designed to simplify and make more flexible and secure the creation and deployment of applications. This new architecture "makes the product a native web citizen rather than a proprietary world of its own," as has been the case until now, and will make SharePoint 2013 "more modular and open than any prior release." At this juncture, CIOs and other IT executives should rethink the role of SharePoint in their organizations. For example, if SharePoint is used only for document collaboration, it is an expensive proposition for which more affordable options exist, according to the authors. 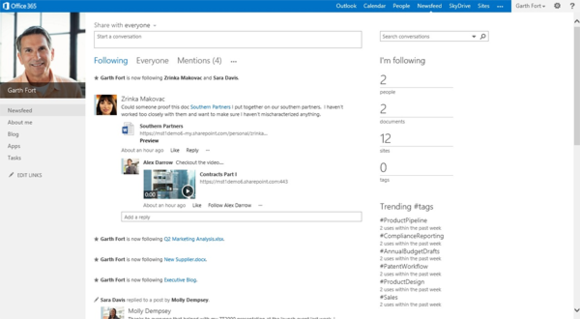 It's also a good idea to monitor how Yammer is integrated with SharePoint, and assess how comfortable the organization is with providing enterprise social collaboration via a cloud model. In addition, CIOs must keep a close eye on SharePoint's mobile capabilities. For Microsoft, the challenges are substantial in areas like social, cloud and mobile, according to Forrester. "At stake is Microsoft's ability to maintain the strong growth curve SharePoint has enjoyed over the past four years," the authors wrote. Dangerous competitors include IBM, Google, Jive Software and Box. "Despite its rousing success in enterprises, circumstances have changed, and SharePoint must prove its value all over again."